These lyrics, sung by the Toy Soldier-dressed doorman out front ring true the moment you walk through the door. 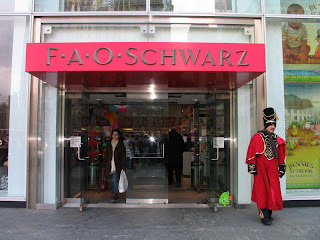 If Santa were to have a warehouse down south, it would be FAO Schwartz. The store has a number of stuffed and wooden toys, that you can imagine were made by a horde of work-lusting elves. The first few sections, one after the next, after the next, are full of these types of toys. All the way to the candy section, guarded by another wave of toy soldiers made out of gum drops and candy corn. The toys here are a delight to people of all ages, bringing back nostalgic joy for a simpler time, while interesting an entirely new generation of children. 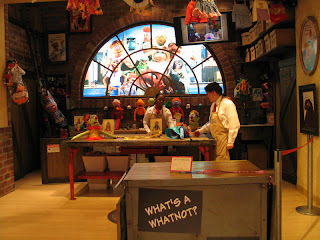 This store also features a Build a Muppet workshop, where customers can choose Muppet bodies, eyes and other facial features, clothing, and accessories. For those desiring an officially licensed Muppet this is the place to be. Taking the escalator upstairs, you'll find yourself passing stuffed animals that would be at home on the African Savannah. Don't be set on taking any of them home though, the giraffe alone will set you back $2700. And the dragon guarding the top floor? That was without a listed price. upstairs you will find yourself in Diagon-Alley, where all sorts of Harry Potter merchandise can be purchased. Scarfs and ties from the for Hogwartz houses are yours for the purchasing, as are replica wands. If you so desired, you could find yourself fully decked out in all the official clothing, with a sorting hat to boot. Chewbacca and Darth Vader stand not that far away, with Batman in the background. 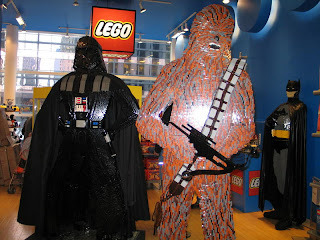 They are constructed completely out of lego. If you'd like a lego Batman of your very own, it will only cost $2700.00 What a bargain! One more section back and you'll find yourself at the big piano. 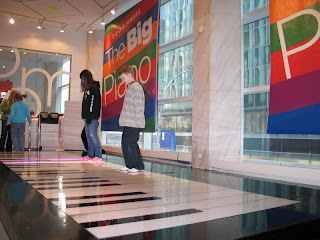 Still in working order, the piano has been set up behind a roped off area. If you'd like your chance to give it a play, you'll have to fight through a line of feisty six year olds. Still – if it's something you really want to do, don't let any tiny ankle biters hold you back. No matter what you're after, this store is for you. It offers the perfect break for couples tired of walking all day, families wanting to explore something other than city streets, and single travellers just looking to rekindle that something missing.